No appetite for restrictions? Realize your ideas with the open source IIoT gateway RevPi Connect. The open source IIoT gateway RevPi Connect gives users maximum freedom when implementing IIoT projects due to its open platform concept (including full root rights). RevPi Connect is based on the Raspberry Pi Compute Module 3 and features a 1.2 GHz quad-core processor, 1 GB RAM and 4 GB eMMC flash memory. A Real Time Clock (RTC) with 24h buffering ensures that the device always knows what time it is, even in the event of a power failure. A specially modified Raspbian version with a real time patch is available as an operating system. Common IIoT protocols like MQTT and OPC UA are supported to transfer machine data directly to the Cloud. Individual applications can be programmed via, amongst other things, Node-RED, Python or directly in C. The modular design of the RevPi Connect enables the 45mm wide base device to be fitted with suitable expansion modules such as digital and analog IOs, fieldbus gateways and radio modules like for example ones for Bluetooth. 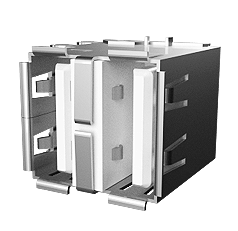 The expansion modules can be joined up – plug and play – with the base device via a socket positioned at the top and can be easily configured using a graphical user interface. Two Ethernet ports enable the device to be simultaneously integrated within the automation network and the IT network to transmit machinery data from, for example, the shop floor to the Cloud or a superordinate IT system. 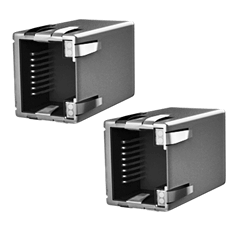 Two RJ45 ethernet ports enable the device to be simultaneously integrated within two seperated networks. A 4 pole RS485 connector to connect for example a Modbus RTU sensor. 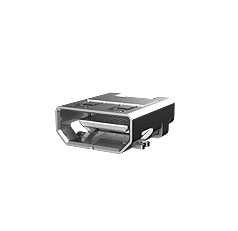 The RevPi Core is equipped with two USB-A connectors at the front side which can be used for USB 2.0 client devices. Both connectors can drive up to 500 mA at their 5 V supply pins. 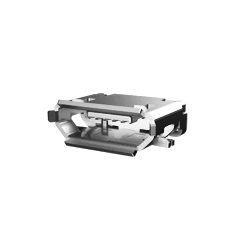 Therefore you may plug USB drives or surf sticks directly into these connectors without the need for an active USB hub. You can connect an USB Host system (usually a PC) with the RevPi Core using the Micro-USB connector in the middle of the front plate. The RevPi Core will then boot in passive eMMC access mode and behave like an USB client memory stick. That way you may flash the module for the first time using an image file from a PC. One Micro-HDMI plug, e.g. for connecting a video monitor. A freely configurable hardware watchdog monitors the status of the IIoT gateway, a relay output serves to ensure that connected devices or expansion modules can be monitored or reset respectively. The device additionally has a 24V input to receive shutdown signals of a UPS. One of our key goals was to give the Raspberry Pi real industrial capability to turn it into a true IIoT gateway. For this reason, the top-hat rail housing of the RevPi Connect is fitted with robust 24 V industrial hardware that complies with the EN61131-2 standard. Although Revolution Pi is an open system on which everyone can install their own software, we have tried to equip Revolution Pi with software and apps that cover most applications. The operating system used is a customized version of Raspbian, which includes a real-time patch of the kernel. In our opinion, this is the best compromise to stay as close as possible to the original development environment of a Raspberry Pi and still get a high control over the priorities of the tasks that the scheduler manages. The scheduler, which controls the execution of tasks by the operating system, can be extensively configured in this modified kernel so that the delays usually caused by network and other I/O accesses are avoided. Suitable drivers for the expansion modules are of course already pre-installed. 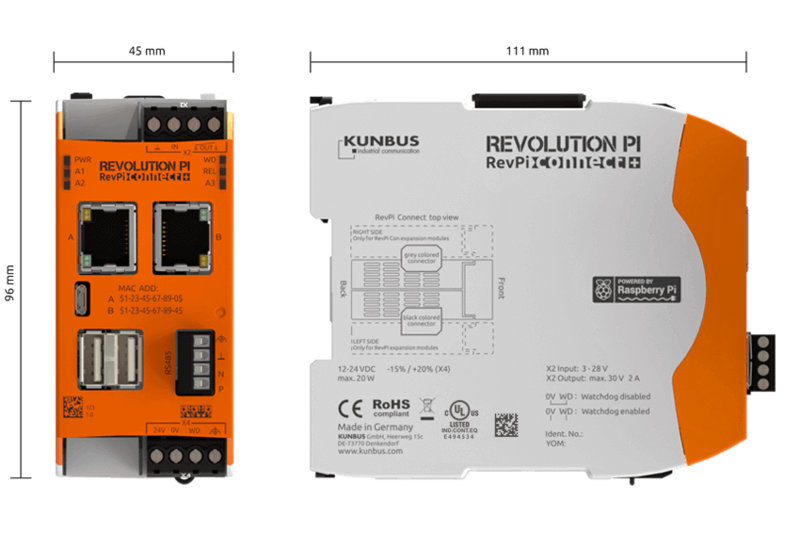 RevPi Connect already has master and slave capability for the popular Modbus RTU and Modbus TCP network protocols. External gateways are therefore no longer required for these two network protocols. Modbus TCP works with the Ethernet interfaces available on RevPi Connect (i.e. via the RJ45 sockets on the front panel) or any other added Ethernet connection (e.g. 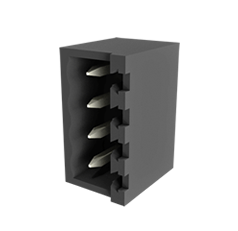 USB WLAN adapter) that provides the TCP/IP protocol. Modbus RTU can be realized via the 4-pin RS485 connector on the front panel. The master and slave configuration is controlled via the browser-based, graphical configuration software PiCtory.